The Philadelphia Eagles returned to Philly as world champs this week and they had a victory parade for the ages. In honor of their big win, defensive end Chris Long generously gifted bottles of Crown Royal XR to the entire 2018 squad. 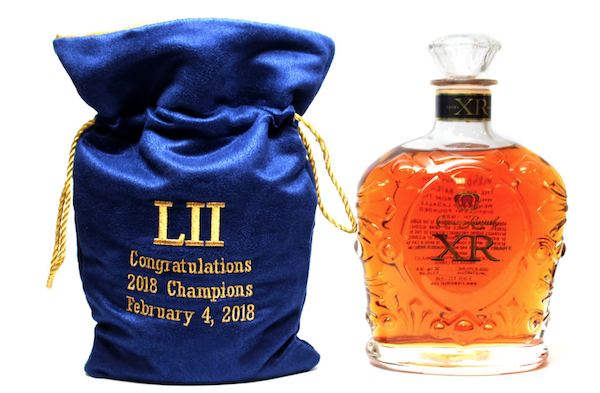 The bottles of $130 whisky come enclosed in blue velvet bags that were embroidered to reflect the team’s achievement (see below). Print article This entry was posted by Art Eddy III on February 9, 2018 at 12:54 pm, and is filed under Lifestyle. Follow any responses to this post through RSS 2.0. Both comments and pings are currently closed.